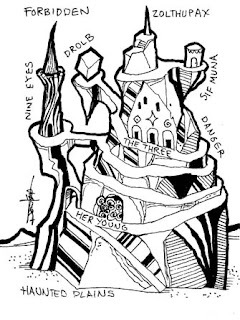 The first of the Microdungeon 10: the Haunted Tower of Forbidden Gods. What makes a god forbidden? Is it enough that worship of the god is outlawed somewhere? Or must the god himself be somehow proscribed? And what manner of authority is required to achieve that feat? Or is there something ontologically significant about the state of being forbidden (at least where a god is involved)? Stinking cool, man. Wandering through the Haunted Desert is bad enough, but to come upon the Tower of Forbidden Gods! Madness ensues. I hope you do more . . .